Tesla and its CEO Elon Musk never seemed bothered by the fact that big-name competition from brands like BMW and Porsche is starting to go mainstream. And while Tesla has been hiding behind its belief that it still has a superior product, BMW and Porsche have been working the background, beating the company to the punch on all things charging. Both auto makers just unveiled a charging station that can give electric vehicles enough power to drive about 62 miles on less than three minutes' charge, putting them both ahead of Tesla. The prototype charger is said to have a capacity of 450 kW, which is more than triple Tesla's Superchargers. Vehicles that were tested at this power were brought to 80% capacity in 15 minutes. According to Tesla's website, it needs about 30 minutes for a similar charge. Porsche and BMW worked together in order to develop this charger. 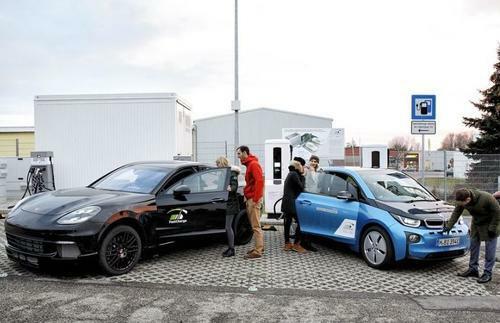 They were also helped along by Siemens and charging experts Allego GmbH and Phoenix Contact E-Mobility GmbH. The first station in Bavaria was opened to the public this week. BMW told Bloomberg that it is free to use for existing models. Adding to Tesla's growing competition concerns, earlier this week we discussed how Porsche Taycan reservation holders apparently couldn't wait to ditch their Teslas in order to own the new vehicle. At this year's Los Angeles auto show, the North American president and CEO of Porsche said that the company has had a "pretty amazing" response to pre-orders for the vehicle. He also went on to say if that if all the people who had pre-ordered the car wind up buying it, it has already sold out for the first year. But even more astonishing is that more than half of the people that are signing up to pre-order the Porsche aren't already Porsche owners. In fact, the number one brand owned by those who are pre-ordering the Porsche is Tesla. Porsche North America President and CEO Klaus Zellmer told CNET: "More than half of the people that are signing up for the Taycan have not owned or do not own a Porsche. Typically, if we look at our source of business, people coming from other brands, it's Audi, BMW, or Mercedes. The no. 1 brand now is Tesla. That's pretty interesting, to see that people that were curious about the Tesla for very good reasons obviously don't stop being curious." While some EV models won’t be able to take advantage of the new charging station yet – for instance, the BMW i3 limits power intake to 50 kW - future vehicles will have access to the benefits and this new innovation again confirms that Tesla is no longer the leader of the (battery) pack.